Joining Shameik Moore, as he takes on the role of Miles Morales, is New Girl's Jake Johnson as Miles' reluctant mentor, Peter Parker. Liev Schreiber plays the larger-than-life crime lord Kingpin and Hailee Steinfeld is the voice of Spider-Gwen while Nicolas Cage (yes, Nicolas Cage!) takes on Spider-Man Noir. Mahershala Ali is Miles' influential uncle Aaron, Brian Tyree Henry plays Miles' father Jefferson, Luna Lauren Velez is Miles' mother Rio, and the ever-wonderful Lily Tomlin is the ever-wonderful Aunt May. 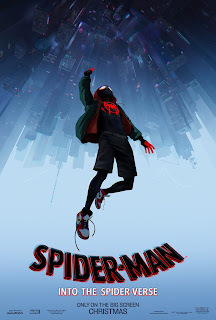 Spider-Man: Into The Spider-Verse comes out on 14th December.